Madame Ching is one of the latest collaborations between Bruno Cathala and Ludovic Maublanc. 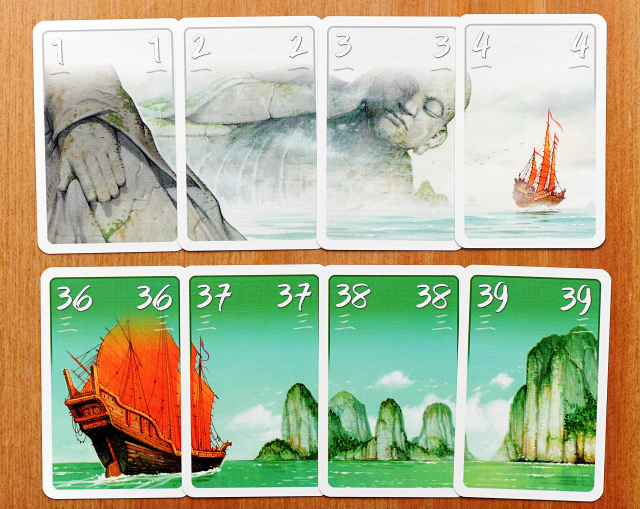 Each player controls their own junk on the Sea of China. Everyone is in the employ of Ching Shih, one of the most successful pirates in Asian history. Shih was known to have developed a code among pirates. She shared ill gotten goods fairly equally among her crew, but she’d be brutal if anyone broke her laws. The punishments could be public lashings or even death! The goal of the game is to acquire the most loot in the form of gems and coins to win the favour of the infamous Madame Ching. Throughout the course of the game players will go on a number of missions gaining rewards along the way. 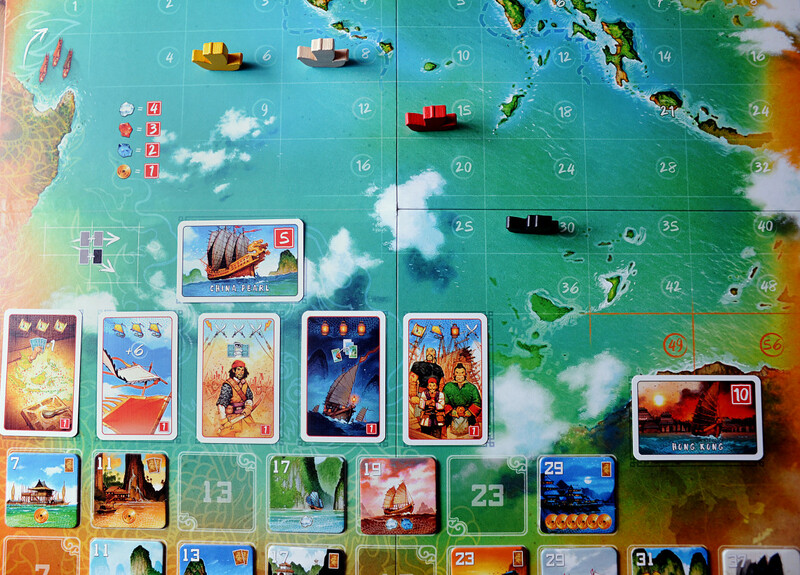 The board represents the Sea of China, broken up into a grid of numbered spaces. 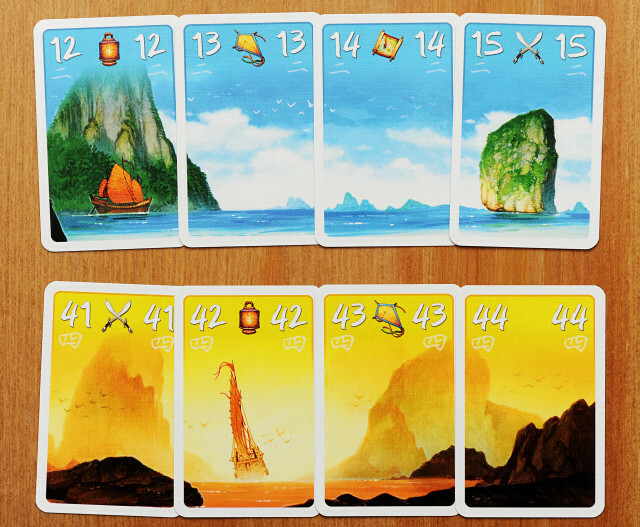 Each turn players will play a navigation card from their hand to advance their current voyage or end it and start another. 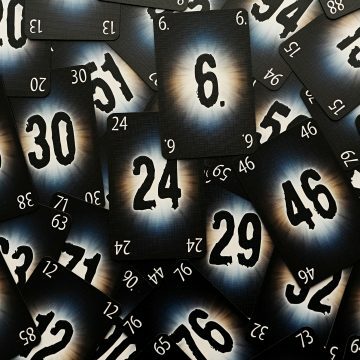 Navigation cards are numbered 1-55 and broken into six different colour groups. Players start with four cards in their hand, they’ll play one each round and draw back up. Each player chooses a card and they are revealed at the same time. The highest played card will act first in that round. If you play a higher Navigation card than the previous turn you will advance your ship. If it is the same colour as the last card you played you will move straight forward. If it is a different colour, you’ll move diagonally forward. Playing a lower navigation card will end the current voyage you’re on and put you back to the starting space of the grid, effectively starting a new expedition. When you end the mission that you’re on you are able to gain a mission tile depending on how far you’ve traveled. The grid is made up of numbered spaces and the further you’re able to travel on a turn the better the reward will be. Some Navigation cards will also contain one of four nautical symbols on them. If your expedition contained cards that had three of the same symbols (kites, lanterns, swords, maps) then you can gain a Skills card. These cards are worth point at the end of the game and have a one time use benefit during the game. They can allow you to hold extra cards, steal cards from other players, ignore the rules for Navigation cards for a round and gain higher value mission tiles. An expedition ending with all four symbols will earn you a wild card. They have no in-game effect, but the first person to gain a wild card will also get the China Pearl card, worth five points. Wild cards also take you one step closer to game end. There are Encounter cards you can earn throughout the course of the game. They can be attack cards, defence cards or end game point cards. You can also gain a whopping ten points if you can make it to the far reaches of the Sea of China, all the way to Hong Kong. Getting to space 49 or 56 on the grid will get you the Hong Kong card. Very difficult to accomplish! Madame Ching will end when either one player get all four of the skills cards (any or all replaceable with wild cards) or when all the mission tiles have been claimed. Then it’s simple math to see who has gained the most loot and will earn a spot on the crew of one of the most successful pirates in Asian history. 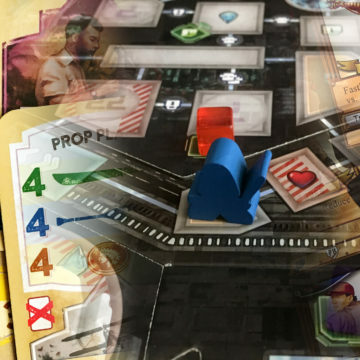 Madame Ching, when first laid out on the table looks complicated, but once you’ve played a few rounds it’s really straight forward. The biggest hurdle is how the Navigation card numbers work versus the grid on the board, but it becomes clear pretty quickly. I’m not positive that it will be a must have for everyone, but I think it should be a must try at least. Games can be banged out in less then an hour and the simultaneous gameplay mean that everyone’s involved at all times. Check out Madame Ching if you get the chance. 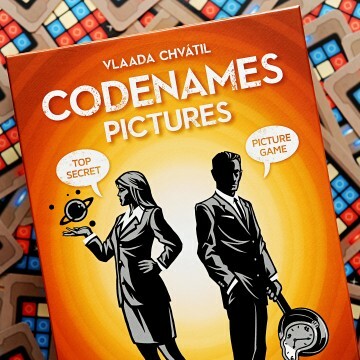 It’s my new go to filler game before moving on to meatier fare!